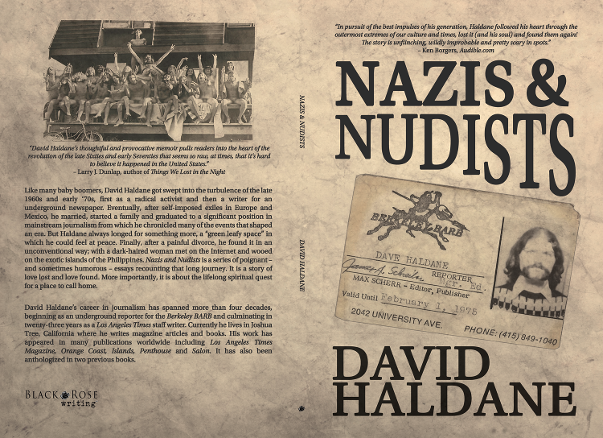 David Haldane's new memoir, Nazis & Nudists -- finalist in two categories of 2017 Next Generation Indie Book Awards and recipient of numerous 5-star reviews -- is now available in paperback, audio and digital formats at Black Rose Writing, on Amazon and on Barnes & Noble. Check it out! A master nonfiction writer, Haldane melds the personal and reportorial to explore the human condition, especially his own. As a long-time journalist and former Los Angeles Times staff writer, he is a keen observor of the way things are whose passion for stories has led him to many continents. Much of Haldane's work utilizes his own experiences as mirrors reflecting the larger, insanely complicated and gloriously colorful world in which we live. When he's not dancing with elephants, he can often be found at home in the California desert helping his Filipino wife raise their young son.